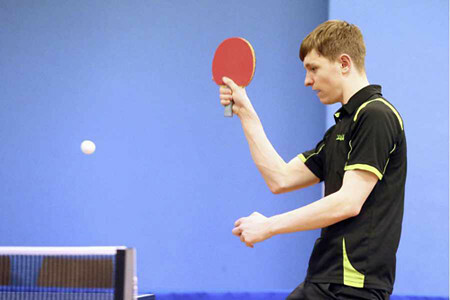 Josh Stacey (pictured) last night claimed one of the biggest tournament victories of his career as he won the Capelles Open Singles at the Guernsey Table Tennis Centre. The 20-year old ended Garry Dodd's long winning streak in this tournament that dates back to 2009 with a thrilling 11-9 victory in the final. There was a decent entry of 33 players, young and old competing, including some of the successful Boys team from the weekend's Primary Schools International. Stacey came through the group stage unscathed and then defeated Albert Unden and Ben Foss in the next rounds to set up an intriguing encounter with the in-form Josh Butler in the semi final. Both players put on a fantastic display of attacking table tennis featuring many powerful top-spin hits from the back of the court. It was Stacey who prevailed by a 3-2 margin, 9-11 11-6 11-6 8-11 11-8. In the other half of the draw, Dodd looked to be on top form after topping his group by beating Peter Powell, Peter Vivian and Mick Ingrouille. He then defeated Ken Falla in the first round, followed by an impressive win over 6-time champion Phil Ogier in the quarter final. The semi-final pitted him against Lawrence Stacey, but Dodd again showed his class, winning 3-0 for the loss of only 6 points. Most were predicting a similar result in the final such was Dodd's form but Lawrence's twin Josh had other ideas. After losing the first end of the final 11-6, Stacey upped the ante and produced a mixture of blocks and counter hits to bounce back and win the next 2 ends, both 11-8. Dodd, however, had won the Capelles Open for a record 7 consecutive years was not going to let his title go without a fight. He duly won the 4th game 11-6, displaying his full repertoire of shots but started slowly in the the 5th game and went 6-1 down. Such is the talent of the multiple time champion that nobody would write him off and he came storming back to 7-7. But Stacey took a 1 minute time-out to compose himself and subsequently held his nerve and through a mixture of blocks, forehand loops and effective fast serving, clinched 4 of the last 6 points to win the trophy for the first time.